For my stocking this Christmas, my wife included two adorable little SD Gundam figures she picked up at Uwajimaya here in Seattle. They were all the rage back in Japan in the 80’s, and I have fond memories of playing in the schoolyard dirt with adorably chibi versions of Guntank, Dom, Zaku, and of course the titular Gundam RX-78-2. There are about as many variations on Mobile Suits in the Gundam canon as there are stars in the galaxy, and Moko has built the “SUPERIOR DRAGON” character from the Gaiden storyline. 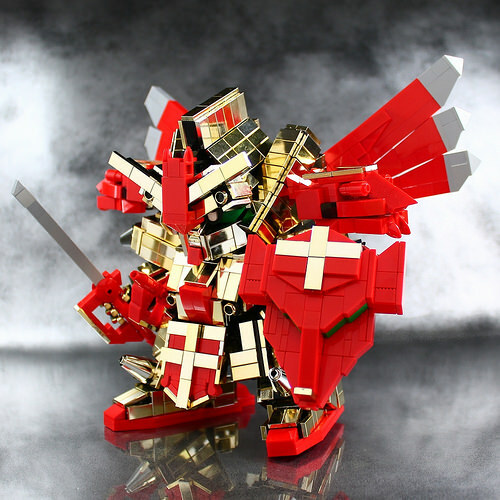 Notably, Moko has used nothing but stock chrome-gold parts for his build — mostly the rare 1×2 gold-chrome tiles that only came in three City sets back in 2003. Rather shockingly, I think I see several chrome-gold C-3PO arms for Gundam’s fingers! The dual lances can combine with part of the shield to form a bow, and the wings spread out like many of the stock toys and plastic model kits. 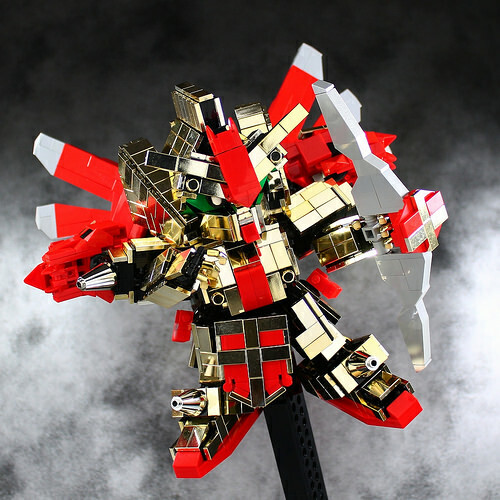 Moko says on his blog (where you can see more photos) that he’d been putting off building this because he thought getting the shape right with the very limited parts selection would be too hard. But he also says he wanted to end 2015 with flair, and I think he’s certainly done so! I’m drooling over all that chrome. It’s more than likely that the chrome minifig arms came from the gold minifigure key chain promo from 2009. Ah, that makes sense. Phew!